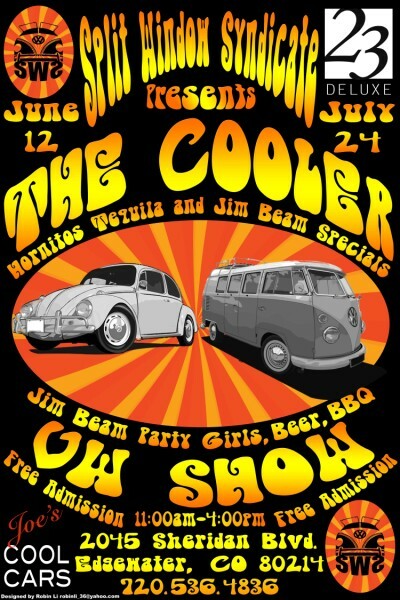 This show will be a combined effort of the Central Alabama VW Club and the North Alabama VW Club. This show replaces the annual July Show. The Oktoberfest Board and The City Of Cullman has given great support for this show. The entire city will be one big festival. German food,German beer and root beer,Arts,Crafts German music,auctions,yards sales and free museum admittance. Come Friday night for the Burgermeister’s ball and stay until Sunday. Be ready to do the chicken dance. Camping will be available on site with electric hookups. Full hookups are available at Sportman’s Lake Park and Smith Lake Park not far from the site. A limited number of reduced rate rooms are available at the Holiday Inn Express at exit 310 on I 65 about two miles from the site. $10 registration for door prizes will be at the show entrance. No judging or awards. Just come have fun with us. If you have a German car or European car or other all are welcome. Driven,trailered,towed or pulled by a tractor come have fun with us. Once again, the best in Alabama Volkswagen shows will be brought to you by the same group as before. Please note that this year August has five Saturdays therefore the show will be held on that last Saturday, the 29th. Anyway, as before, this is a show open to any and all Volkswagen and Volkswagen based vehicles (this includes you fancy Audi folks as well) This includes everything from a split window Beetle to a mk7 Golf. The people running this show own VWs of all types. We have some cooled by air, some by water, some powered by gasoline, some by diesel. We drool as equally over the og paint patina’d split window Bus as we do over the swallowtail Rabbit that pulls up. So, whatever VW strikes your fancy, bring it on. There is camping available on the show site and elsewhere in the park, see park info for camping fees. 14th Annual VW Meltdown,ALL VW Show and Swap…8am-3pm on Saturday,July 25th,2015. Free Spectator and Show Car entry! ALL COVERED SHOW AREA,so rain will NOT cancel. The ’14 show was the largest ever,and filled the shaded show area up,so get there early.Additional outside spaces will be available though. The Boy Scouts will be cooking on the big grill,and we are next door to Hardee’s also. WELL BEHAVED pets on leashes are allowed. Visit the East Coast’s fastest growing VW Show!! Last year over 100 VWs in attendance!!! Calling all Air and Water-Cooled VWs!!! The Ironbridge Sports Park will be again hosting our show this year. Besides checking out the hottest VWs around, you can hit the swap meet or hit the go-cart track, lazer tag, mini golf or driving range. Outstanding facility with indoor air conditioned Cafe and Restrooms. Plenty of fun and food available all at reasonable prices! Hood Ride, Oldest VW, Farthest Driven, & kids coloring contest and BEST VW TATTOO Contest!!! The Biggest VW Show in Texas!!! Hot VW’s Coverage! Der Luftkülers (DLK) and Lewisville Volkswagen proudly present Düb Splash 2014. Come hang out with fellow Volkswagen enthusiasts and show off your Düb Sunday JULY 6th 2014. Over 50 classes including both Air-Cooled and Water-Cooled VW’s with the BEST trophies in Texas. Düb Splash 2014 is being held at the 1950’s Vintage Sandy Lake Amusement Park in Carrollton Texas. Sandy Lake Amusement Park is the perfect venue for a hot summer car show with lots of shade, swimming in the wave pools, paddle boats, a live DJ and tons of vintage rides. Düb Splash is sure to provide cheap summer entertainment for the entire family!! Doors open at 8AM, Judging to begin at 11AM, Awards Ceremony at 3PM. This is our first show so more details are still to come. Check out http://www.medicinepark.com. The show is scheduled to start at 8:00AM and goes to 4pm but stay as long as you want to stay. There will be numerous bands playing all weekend long for FREE. There are several lodging options in town including cabins and a hotel, so stay all weekend and enjoy the music. No entry fee, no judging, just a great time with fellow VW enthusiasts. If you prefer to camp you can do so in the car show area.